Baked Cheeseburger Sliders Recipe - The Cookie Rookie - VIDEO!! This recipe was written in partnership with Borden Cheese. All opinions are my own. 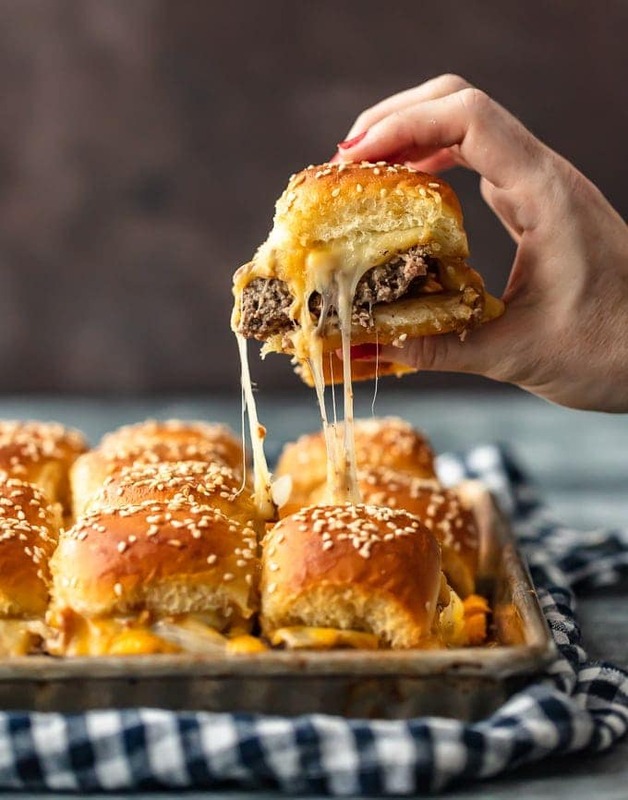 Baked Cheeseburger Sliders are a fun and easy meal perfect for those busy school nights or fun game days! 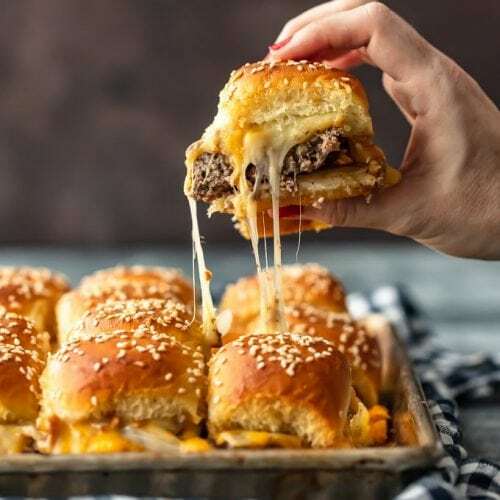 There’s nothing better than this EASY Pull Apart Cheeseburger Slider Recipe for feeding a hungry crowd. So much cheese, so little time! Cheeseburger Sliders are such a fun snack to feed the family. 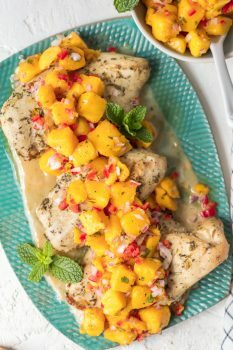 You can have a pan hot and ready the second it’s dinner time- the perfect, quick after school dinner recipe when schedules are busy. Baked Cheeseburgers make feeding a crowd super simple, and you can customize toppings according to who’s eating! Easy, fun, and delicious. I simply cannot get enough baked cheeseburger sliders in my life. 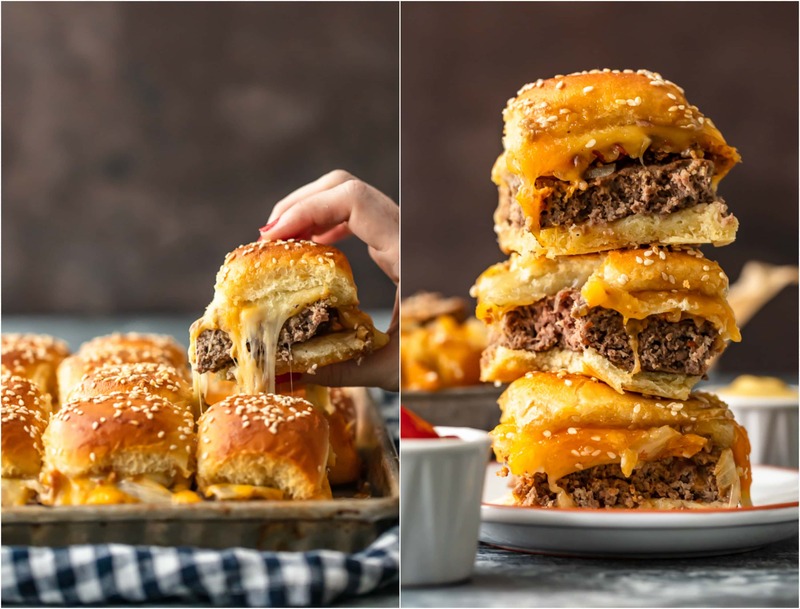 Being a parent is BUSY, especially around back to school, and these Baked Cheeseburger Sliders are just one way to make things easier[AD1] . 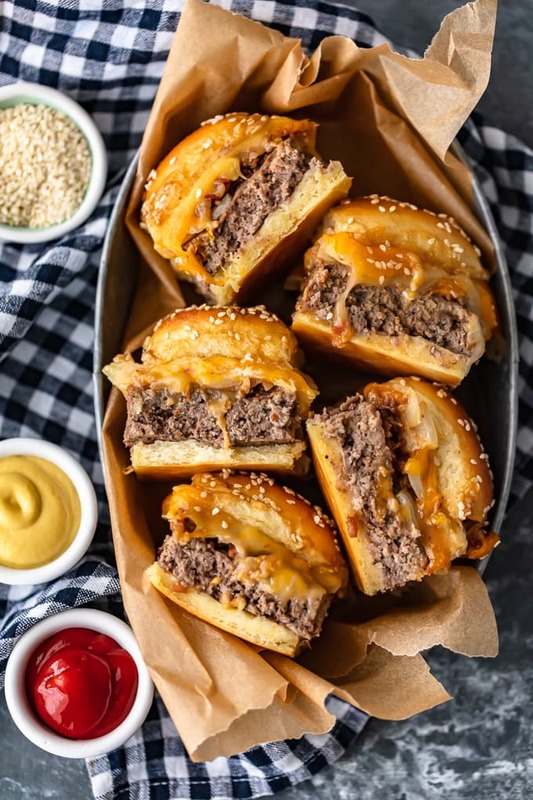 Kids and adults alike crave these bite sized burgers, making them the perfect back to school dinner fix for your family. 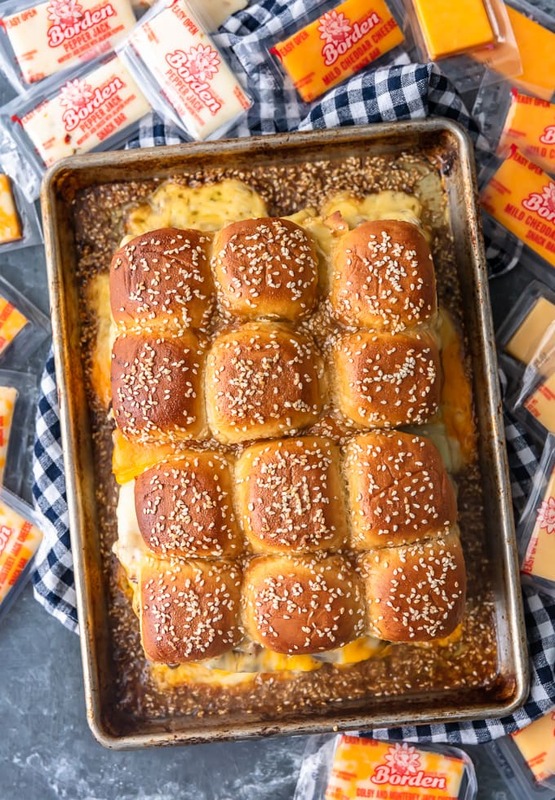 We have made baked sliders before, like our Cheesy Breakfast Sliders, Healthy Chicken Salad Sliders, and Ham and Cheese Sliders, but somehow these Baked Cheeseburger Sliders just feel extra perfect for closing out Summer and ringing in the school year. They’re baked, but still make me think of Summer grilling. Lucky for us, this recipe is SO MUCH easier than firing up a grill! Make back to school that much more delicious with this fun and easy Baked Cheeseburger Sliders Recipe! 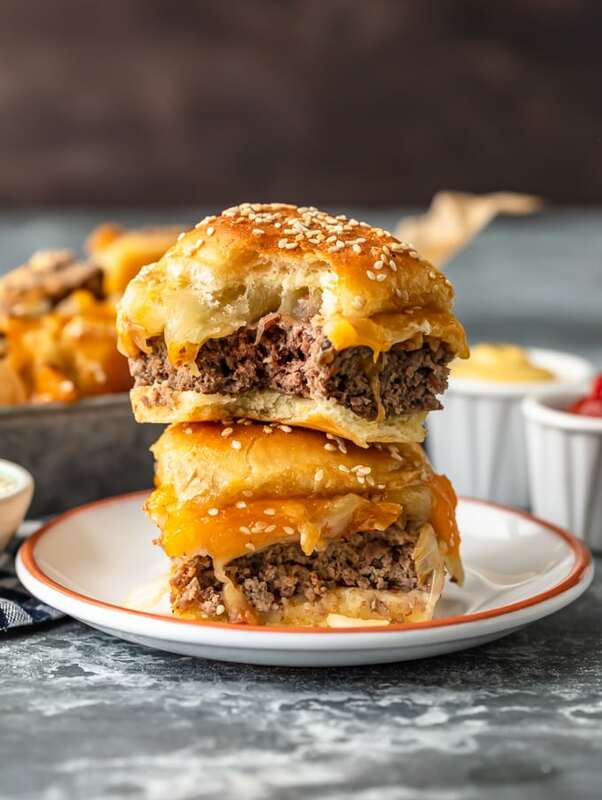 You might have guessed it, CHEESE is the most important ingredient in these Baked Cheeseburgers! For this recipe, I chose to make things simple and fun by using Borden® Cheese Snack Bars! Using Borden® Cheese Snack Bars is such a fun way to get the kids involved (they LOVE to place the cheese on the burgers and help with assembling the sandwiches!) in cooking. 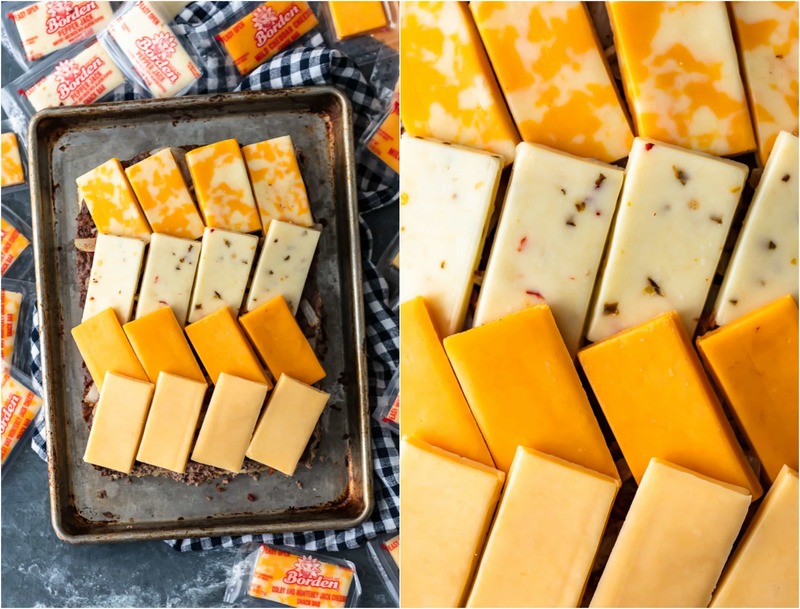 They come in four flavors; Colby Jack, Pepper Jack, Mild Cheddar, and Gouda (!!! ), and could not be more flavorful and delicious. Borden® Cheese Snack Bars are perfect for on the go snacking or nutrition, like throwing in your favorite kiddo’s lunch box!. I love that using these snack bars meant I could make my cheeseburgers in different flavors easily, without breaking the bank. Borden® Cheese knows that sending kids off to school with food that is both fun AND nutritious is important, and these snack bars make it oh so simple by adding an extra 5g of protein to the day. 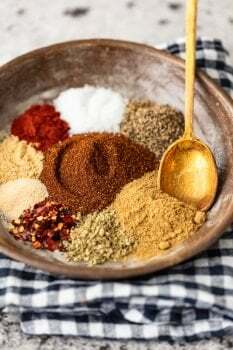 Combine the beef and spices in a bowl. Press the beef into the bottom of a 9 x 13-inch baking dish into a flat and even layer. Bake for 20 minutes. Drain the liquid and set aside. In a large skillet over medium/high heat add 1 tablespoon olive oil. Add in the diced onion and stir to combine. Cook until onion is translucent and fragrant. Drain excess oil FULLY and set aside. Slice the rolls in half lengthwise. Place the bottom half in the same baking dish. Top the bottom half of the rolls with the cooked beef, then the onion, then slices of Borden® Cheese Snack Bars in a single layer. Top with the top half of the rolls. In a small bowl combine the melted butter and spices for the butter topping. 1. Brush the tops of the rolls with melted butter mixture and sprinkle the sesame seeds on top. Bake for an additional 20 minutes, or until the bread is toasted and the Borden® Cheese Snack Bars are melty. Slice into individual sliders and serve hot. Enjoy! The great thing about these Baked Cheeseburgers is they’re SO versatile. You can serve them with everything from waffle fries to pretzels. Here are some ideas of great sides to serve with these awesome Cheeseburger Sliders. These are all kid-friendly and family approved! Add some peanut butter! Have you ever heard of a goober burger? It’s a cheeseburger topped with peanut butter. Sounds weird but TRUST ME they’re delish. Add other toppings such as tomatoes, bacon, pickles, or more! Any ingredients that won’t wilt (aka lettuce) would be a great addition to these baked burgers! Get creative with the cheese selection. Remember that Borden® Cheese Snack Bars come in four flavors, so try them all when making these Baked Cheeseburgers! Use Chicken or Turkey instead of Beef. Any ground meat will work in this fun and easy Cheeseburger Slider Recipe. WIN! Buffalo Chicken would be a fun variation! 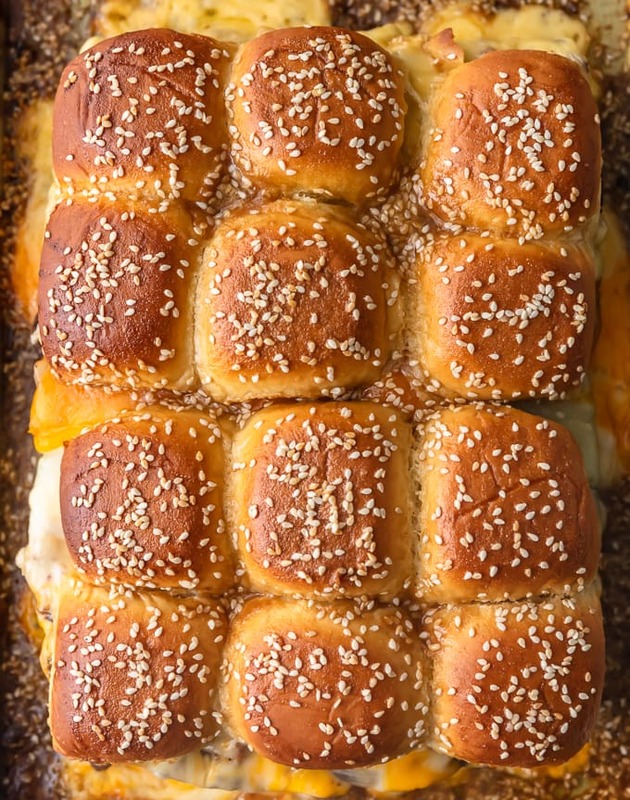 We hope you love these Baked Cheeseburger Sliders as much as we do. We had so much fun making them, and even more fun eating them! I think they’re the perfect recipe for feeding that crowd of hungry kids when they come home from school. Henry already loves these, and he’s not even two! I have a feeling we will be making these for years to come. Be sure to check out new Borden® Cheese Snack Bars at your local grocery store! Check out where to buy HERE. SO FUN! See the recipe card for details on how to make Baked Cheeseburger Sliders. Enjoy! If you like this cheesy recipe, be sure to check out some of our other favorite recipes with cheese! 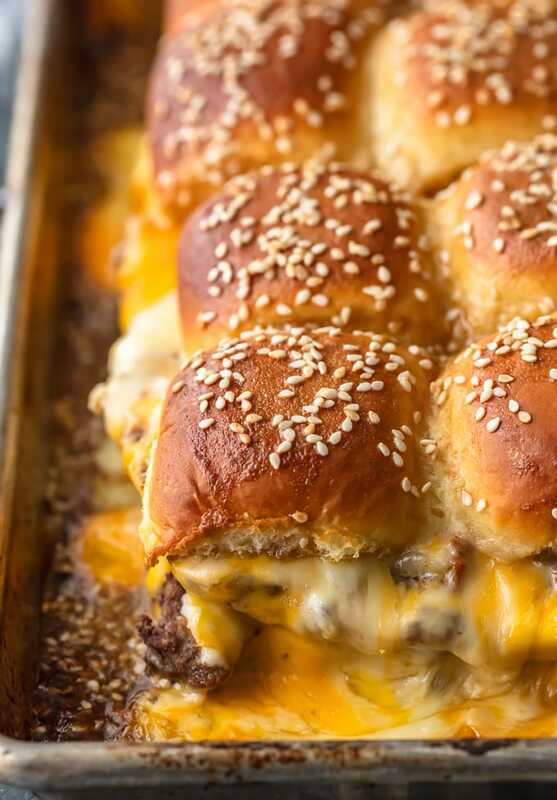 Baked Cheeseburger Sliders are a fun and easy lunch of dinner perfect for those busy school nights or fun game days! 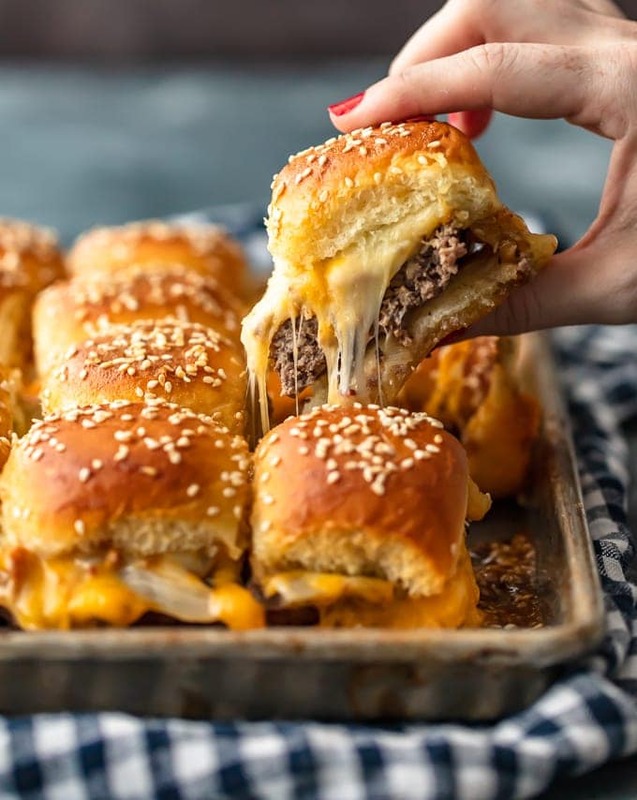 There's nothing better than this EASY Pull Apart Cheeseburger Slider Recipe for feeding a hungry crowd. So much cheese, so little time! In a large skillet over medium/high heat add the olive oil. Add in the diced onion and stir to coat. Cook until onion is translucent and fragrant. Drain excess oil FULLY and set aside. Top the bottom half of the rolls with the cooked beef, then the onions, then slices of cheese in a single layer. Top with the top half of the rolls. Brush the tops of the rolls liberally with melted butter (or pour it over) mixture and sprinkle the sesame seeds on top. Bake for an additional 20 minutes, or until the bread is toasted and the cheese is melty. Note: The Sesame Butter is optional. You can use as little or as much as you'd like. It helps to keep the bread from getting too dry and toasted. Alternatively, you can tent the dish with foil to keep the tops from burning. This came out so good! Mmmmm mmmm mmmm! I made it exactly as described and it turned out perfectly! Yay! So happy to hear that!!! How do you transfer the beef out of the baking dish, and then on to the bottom half of the buns? I watched the video but it didn’t show this part of the process. Thank you! I drained the liquid out of the baking dish, patted it dry with a paper towel, and then used a fork/spatula to transfer it over to on top of the bottom buns. If you let it cool slightly you can just use your hands (or a clean towel). Hope that helps!